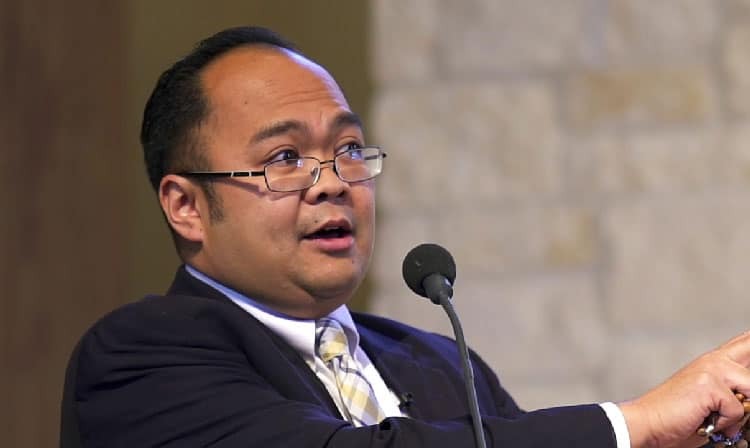 A well-rounded, rigorous, and traditional graduate education is rare, but Christendom graduate school alumnus and high school theology teacher Dr. Roland Millare is proof that such an education exists. Millare chose to attend Christendom’s graduate school because it not only offered a rigorous and traditional theological education, but also because of the summer studies program – which was exactly what he was looking for in order to complete his MA. Credit to St. Theresa Catholic Church. As a high school teacher, Millare had the summers free, and found that the residential summer program was a good fit for him and his schedule. After earning his Masters in Theological Studies from Christendom, he then continued on to receive both a licentiate and doctorate in Sacred Theology. “The rigor of the classes in terms of reading and writing, the experience of writing and defending a master’s thesis, and the preparation for both written and comprehensive exams prepared me for further graduate study,” he explains. Millare has published articles and book reviews in various publications such as The Adoremus Bulletin, Logos, and Nova et Vetera. He is head of the theology department at John XXIII College Preparatory in Texas as well as an adjunct professor of theology at the University of St. Thomas’ School of Theology at St. Mary’s Seminary. In addition, he is the director for the Shepherd’s Heart Initiative at the John Paul II Foundation, which focuses on continuing education for clergy. Millare attributes his successes in the field of education to his formation at Christendom’s graduate school. For more information about the graduate school and to learn how catechists, Catholic school teachers, and Directors of Religious Education can save 50% off tuition, go here.